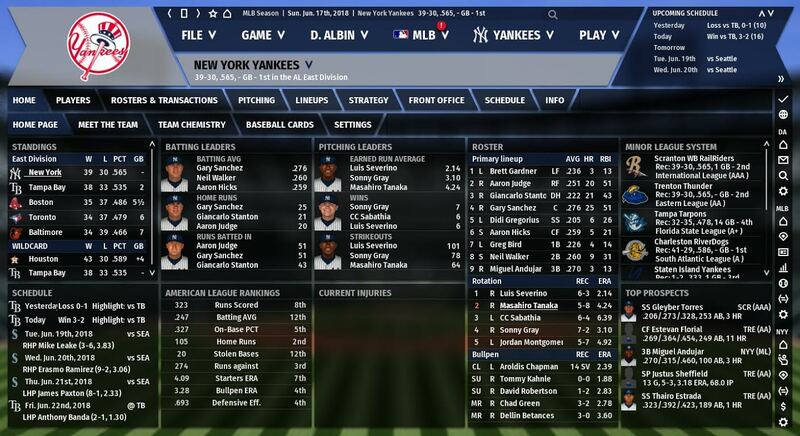 For a few weeks, the OOTP Yanks were on a good run recovering from a so-so start to the season. Last week was a slight bump in the road, but certainly not a backbreaker this early in the schedule. Still, with a good Nationals team and the first place Rays coming to the Bronx in this edition, playing well was pivotal. How’d the alternate universe Yankees do? Many postponed games become part of a doubleheader at a later date. It’s often out of convenience and to not lose a future off day. Earlier in this virtual season, the Yankees and Nationals were rained out in the nation’s capital. Instead of having the Yankees come down to Washington again (which would have cost an off day, just like is happening today in real life), the Nationals and Yankees played a doubleheader at Yankee Stadium, with the Nats the home team for game one. Pitchers hitting at Yankee Stadium? Yup. The first matchup of the doubleheader was a doozy: Luis Severino vs. Max Scherzer. Both were dominant, each twirling seven shutout innings. Severino struck out nine while Scherzer fanned twelve. The game went to extras and a clutch solo shot by Miguel Andujar was wiped away when Tommy Kahnle couldn’t hold a 1-0 lead. In the 12th inning, Gary Sanchez went deep to take a 2-1 lead, which this time the Yankees held on to (thanks, David Robertson). Game two permitted the Yankees to be home in their own home. Unlike game one, this one was not quite as well pitched. Gio Gonzalez was pulled after four innings and Sonny Gray was only able to retire one batter in the sixth inning. After Gray’s departure, the Yankees’ bullpen went to work: Jonathan Holder, Chad Green, and Aroldis Chapman retired 11 of 12 batters faced as the Yankees swept the doubleheader, winning the second game 5-4. The bats on both sides came out to play in the third and final game of the series. it was a good old-fashioned slugfest, with the two teams belting nine homers altogether. The Yankees got the short end of the stick, falling 10-8, though it wasn’t that close for much of the game. In fact, the Bombers were on top 4-0 until the fifth inning, when Masahiro Tanaka imploded. Chasen Shreve and Adam Warren fumbled in relief too, and the Yanks were down 10-5 after seven innings. The comeback, as you know by now, fell short. Enter the Rays. Starting the four-game set, the Rays were 37-30 and the Yankees 36-29. That’s a virtual (pun intended) deadlock, though the Yankees have a slight edge in winning percentage. In game one, everything went right for the hometown Bronx squad. Good starting pitching, good offense, and a good bullpen. All of that was a recipe for success in the 5-2 win. CC Sabathia pitched six strong frames, and Dellin Betances, Tommy Kahnle, and Aroldis Chapman shut the door. In support of the pitching staff, Brett Gardner launched two homers and Gary Sanchez added one as well. The win means first place is officially in the hands of the Yankees. The heroes of the second game were the Yankees’ bullpen. That’s not a surprise, given the depth of the relief corps. After a short outing from Jordan Montgomery (five innings, three runs allowed), the pen was staked to a one-run lead with twelve outs to go. For Chad Green, Tommy Kahnle, and Aroldis Chapman, it was no big deal. They shut the door on what ultimately became a 5-3 win. In the third game of the series, the Yankees mustered just one hit – and still nearly won. The game was a scoreless tie into extras thanks to Anthony Banda and Sonny Gray dominating. The Rays finally broke through in the tenth against David Robertson and held on for a 1-0 win. Sunday’s final game of the week – the one that would determine whether or not the Rays and Yanks would end the week essentially in a tie for first or with the Yankees on top – took 16 (!) innings to decide. From the doubleheader and multiple extra-inning games this week, the Yankees’ bullpen really didn’t need this. Especially with a 2-0 lead in the ninth following eight dominant innings from Luis Severino. 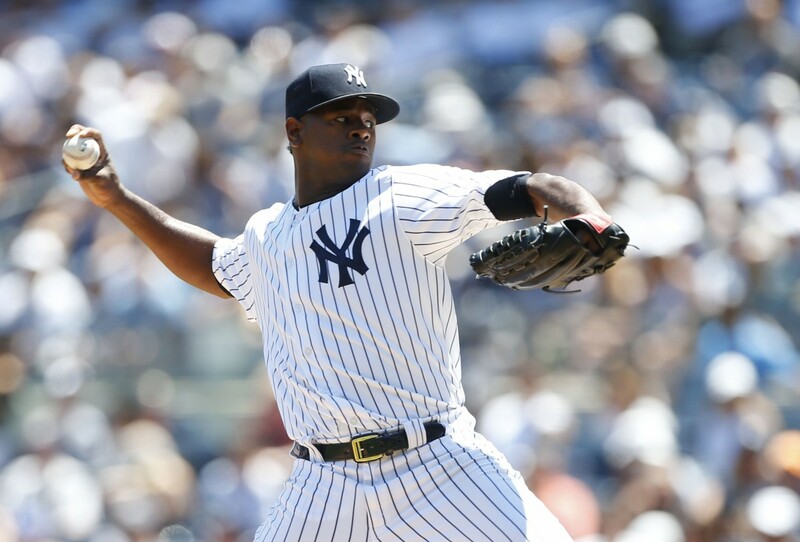 Unfortunately, Dellin Betances blew the save as Chapman still needed more rest. Seven frames later, the Yankees finally won on a Giancarlo Stanton walk-off RBI single against Daniel Hudson. Just your regular 5 hour, 53 minute ballgame. But hey, have to take it now that it puts the club up two games in the division. Oh, and a much needed day off on Monday. The Yankees and Nationals opened the week with a doubleheader at Yankee Stadium…and the Nationals were the home team for game one. Yeah, don’t ask. Nonetheless, the Yankees swept the doubleheader before dropping the third game against the Nats. The next series was against Tampa Bay and had significant implications in the division race. Before the series got underway, the Yankees had a slight not in terms of winning percentage though the two squads were basically even. After the series, the Yankees ascended past the Rays in the division. By taking three of four, the Yankees entrenched themselves ahead of the Rays with a two-game lead. All in all, a pretty great week.